No color's popularity has endured like blue has. It can be warm or cool and is consistently soothing and refreshing in any interior. But today's blue rooms are more than just relaxing; they're daring, bold spaces where the color is explored in many of its various hues. 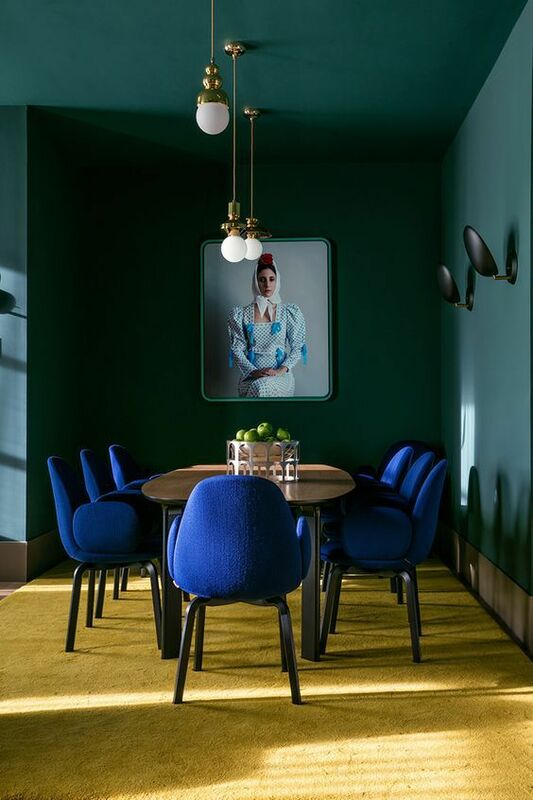 This dining room by Jaime Hayon is a perfect example of the new way to decorate with blue. From the walls to the ceiling to the velvet dining room chairs, the color blue takes center stage in this cozy dining area. One of the reasons that blue works so well is the warmth the shade can evoke. Dark blues are a wonderful alternative to stark black interiors. They have a depth to them and can warm up a room in a way that black cannot. Here, a living room painted in Pottery Barn's Naval shade is warm and cozy. One of the best things about the color blue is that it comes in so many different hues. 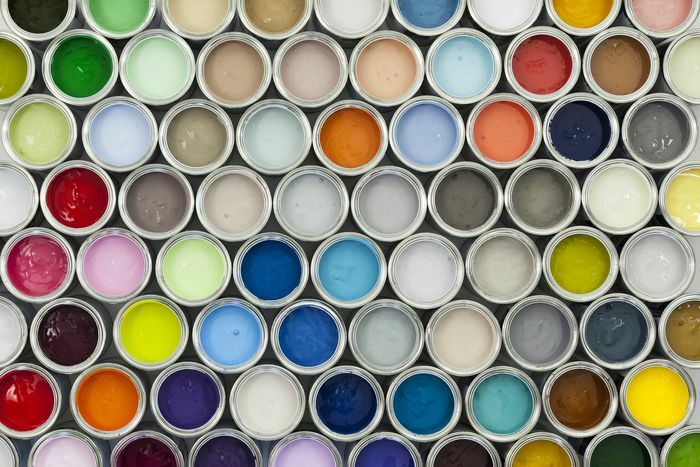 Navy, mint, cerulean, cobalt, and that's just to name a few. Here, a cobalt blue bedroom feels bright and energetic when married with other vibrant hues. Purple, pink, orange, and yellow all look perfect against the deep cobalt color. Blue is fun to layer, but mastering layers of blue can be tricky for many design enthusiasts. It's important to note that all shades of blue are not the same. Some can be cold and icy while others are warm and inviting. When color-blocking a blue room, layer shades that have a relationship with each other. Here, the blue velvet sofa, the side chairs, and the patterned rug all have the same tone. The colors speak to each other, allowing the lighter blue walls to work mainly as a neutral backdrop in this living room. At Hotel Le Montana in Paris, blue walls dominate this suite. The chalky shade is accentuated by black trim. To break up the color palette, pastel furnishings have been brought into the space. A pale sofa and mauve side chairs add a sophisticated touch in this blue room. Blue has the power to be a beautiful neutral, and when the shade goes light, it can sometimes read as gray. In this pale-blue living room, blue-gray walls add a sophisticated touch to the space. The color energizes and updates an otherwise traditional interior and beautifully complements the fireplace. Blue isn't just for the living area. The color is the perfect backdrop for a relaxing bedroom retreat. In this bedroom, the moody navy blue perfectly accompanies many of the other dark shades in the space. A complement to the blacks and grays, the neutral shade is one that certainly works well with others. This chalky shade of Navy Yard from AphroChic's Brooklyn In Color collection is also available as chalkboard paint—another great way to use blue in an interior. The walls in this living nook are painted a minty blue. The color is accentuated by a series of floor tiles by Morocco's Popham Design. Hexagonal tiles in navy, mint, and aqua bring the color blue from the walls down to the floor of this space. In this refined living area, blue has been expertly color-blocked in this interior. From the sofa to the walls and even the drapery, shades of cool light blue play off of each other in the space. To ground the soft color palette, beautiful cream rugs break up the color block, and shades of gold are used to add warmth to the cool hues. Moody blue can add gorgeous depth to your bedroom. This dark but elegant blue comes to life when paired with soft pastels and neutrals. Pale lilac and white create a cool contrast against the dark blue walls. When looking to beautifully design a blue room, it's important to find other shades that you can pair the color with. In this room, blue-on-blue living is warmed by rich metallics. Copper lighting adds a shimmer to the dark color palette. A contemporary living room takes on a sophisticated air in a color palette of dark blue and lilac. Walls in a lighter shade of the hue are the perfect backdrop to the dark velvet seating and bold artwork. In this dining room, cool contrast is the trick to making this shade of blue shine. Ebony stained floors and dark wood furnishings stand out against turquoise walls and drapery. The rich color palette makes this one cool dining room. In the bedroom, wood paneling takes on a whole new life with color. Rather than retain the dark hardwood, here it's been painted a rich royal blue that literally shines in this bedroom. Paired with complementary shades like dark brown, this blue bedroom wall is the ultimate statement piece. This tranquil blue dining room is brought to life by a rich shade. The color on the wall is so deep that you feel as if you could reach out and touch it. The tactile hue is enriched by warm woods and a colorful painting that marries the color palette in the room.